Blending simple luxuries with off-the-beaten-track rainforests, waterfalls and wildlife – one of the finest experiences you’ll find glamping Australia. If it’s privacy you seek, we’ll point out enchanting, hidden spaces for you to retreat to, to spend time with yourself or your loved one and nature. 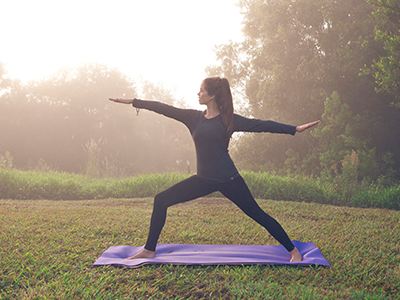 Do as little or as much as you like during your Nightfall stay. 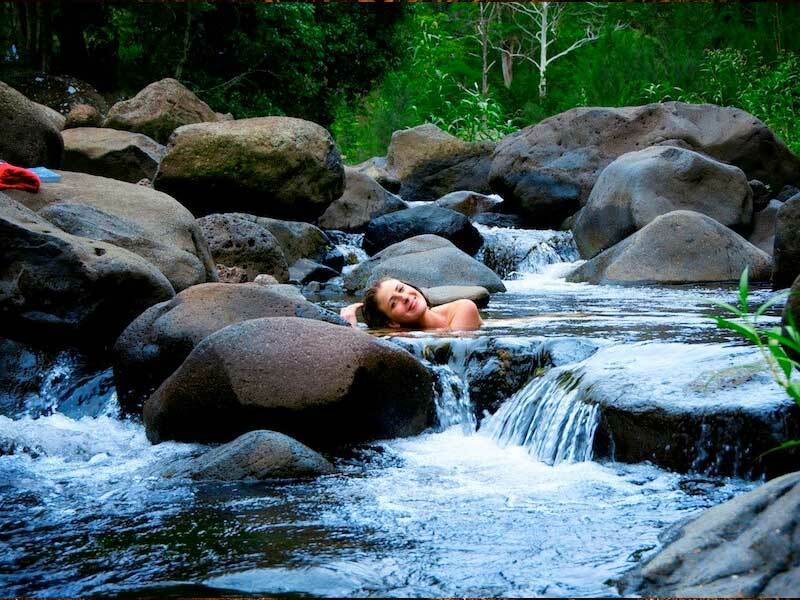 Lounging in the sun in a bean bag or unwinding in “Nature’s Spa” (a swirling, bubbling, natural spa in the middle of the creek). We can provide a guide to take you on the famous but difficult Stinson wreck hike. Our property is a bird-watcher’s haven: grab our binoculars and set out with a picnic lunch and see how many species you can spot. For those who enjoy company, like-minded guests often gather around the lounge fireplace, for a drink, a chat and always lots of laughter. At the close of the day, Nightfall comes alive with new sensory experiences. 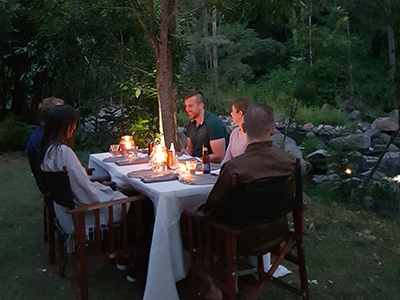 Pre-dinner drinks are followed by delicious meals, served under the stars and beside the campfire with your fellow guests, or in intimate settings for those who seek privacy and romance. It’s refined but unpretentious organic food, prepared by your hosts and focussed on simple flavour combinations and high-quality seasonal ingredients. Nightfall doesn’t offer a menu – instead, guest’s likes and dislike are gathered before your stay and taken into account to craft a meal which emphasises a seasonal philosophy. A lot of our food is sourced from Nightfall’s kitchen garden, wild-harvested or purchased from local, family-run farms where possible. Nightfall’s personalised approach easily caters for vegetarians, vegan paleo, “raw” foodies and those with food allergies. Lunch is another highlight. Your backpack picnic makes it easy to tailor your day…you can eat when you like, where you like. Many guests use the opportunity to explore Lamington National Park finding a spot to picnic under the rainforest canopy. For others it’s all about chilling and lunch can be enjoyed in the beanbag seats beside the tumbling creek waters only metres from Nightfall’s guest lounge. For those who don’t want to laze in their tent all day…there’s no need to…with majestic views from your tent balcony, to the cosy king bed, vintage tin baths with views to the forest and rotating fireplace…you might choose to “stay in” for your lunch. There is a fridge and kitchenette with complimentary goodies including sweet and savoury snacks, plunger coffee and teas. Rapids with private natural spa-pools beckon, so too do wilderness massages, lazy hammocks, evenings under the stars beside the campfire and the decadent privacy of your tent accommodation. Think of days where you can do as much or as little as you like… and, even before you’re hungry, sumptuous meals and cold drinks appear, as if by magic. For some the ideal is to find a relaxing spot, in the forest or beside the creek, to read, daydream or spend tender moments with a loved one. For those who crave adventure, energetic expeditions await. You can head into the tangled forest on a self-directed journey or choose a unique guided-walk through privately-held conservation land and Lamington National Park. Your local guide is an expert, eager to share a detailed knowledge of our Lost World history, culture, birds, wildlife and plants. Without formed tracks at this part of Lamington NP, nightfall’s guided-adventures give access to attractions beyond the reach of the average traveller. 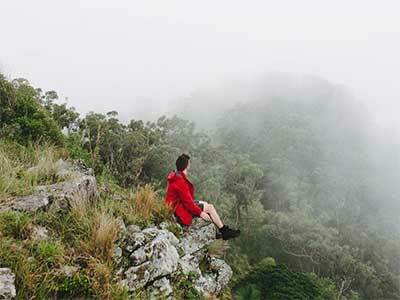 They are custom-designed to ensure you see our breathtaking Scenic Rim wilderness in a way which suits. With only eight adults staying at any one time, nightfall camp is a personalised and tailored experiential travellers retreat. Nightfall’s luxury tents are well-spaced and surrounded by forest. If it’s privacy you seek, we’ll make sure you’re aware of the enchanting hidden spaces dotted around nightfall’s camp. As hosts, we delight in unobtrusively ensuring your every need is met. For those who enjoy company, like-minded guests often gather in the camp’s lounge. It’s an opportunity to relax, laugh and share stories around the main campfire. Evenings are a time to watch stars and immerse in the history, sacred ‘dreaming’ stories and cultures of pioneers and civilisations past. The camp kitchen is also where your hosts prepare nightfall’s signature fire-cooked cuisine.